Keratoconus is a progressive condition that causes the corneal (outer clear window of the eye) to become misshapen, which distorts the vision. This progressive disease continues to change the shape of the cornea causing the patients quality of vision to become worse over time. This condition can be caused by trauma, it can be passed down within the family, some believe that even chronic eye rubbing can cause this condition, however the exact cause is not written in stone. Generally many eye care professionals focus on a list of risk factors to pin point those who maybe likely to develop this condition. Since this condition can hit at any age many eye care professionals look for symptoms within their patients. There are many symptoms of Keratoconus and many of them overlap other conditions so telling your eye care professional all your symptoms can help them rule out other conditions. Symptoms of Keratoconus can change as the condition progresses. In the early stages it is likely that no symptoms will be felt, however it can be detected by a standard eye exam. Making sure you get regular checkups can help with early detection. As the disease progresses you can have more increased symptoms such as frequent need to rub the eyes, more frequent changes to your prescriptions, and even increased dry eyes. Many people use over the counter Artificial Tears to help gain relief of some symptoms. Others don't notice the symptoms until the disease is much further along. This can hinder the overall treatment of the condition. 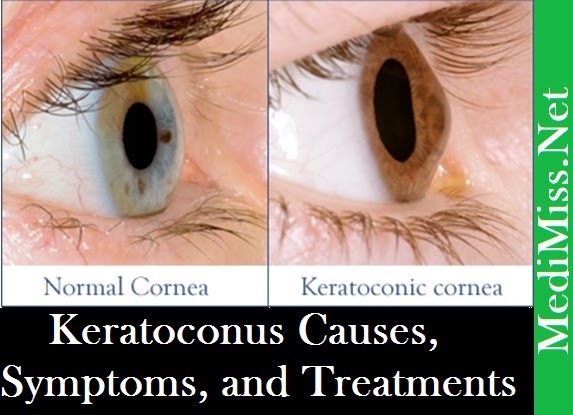 There are several improvements to the treatment of Keratoconus. In past years many patients had limited treatments that included an invasive and painful Corneal Transplant which caused long recovery of vision. Today there are several treatments that help avoid the need for Cornea Transplant to less than 5% of those afflicted with Keratoconus, these treatments include Holcomb C3-R ® and INTACS. This treatment involves applying a special eye drop solution that contains a natural vitamin, Riboflavin, along with other components to the eye, which is than activated by Ultra Violet lights for 30 minutes. The UV light activates the special eye drop solution to create stronger collagen in the cornea. This is a non-invasive procedures and uses natural vitamins already made by our bodies. The vitamin penetrates the corneal fibers and over the course of a few months improves the strength of the cornea, and stabilizes the vision of the patient. In combination with other procedures like INTACS it can give the patient even more overall quality of vision. INTACS have been around used for Keratoconus since 1999. These are tiny semi-circle implants placed within the layers of the cornea to help support your cornea. These implants help to reshape the cornea and reduce the area that is bulging and causing distorted vision. This treatment has little pain, and quick recovery allowing the patient to combined other procedure for more improvements and faster results.